Travel from Christchurch to Dunedin on this 14 day tour of New Zealand's South Island. Explore the Canterbury coastline and Otago Peninsula, getting up close and personal with some of the local wildlife. Head south to Fiordland National Park for a stunning day hike on the Milford Track, and then on to the adventure mecca of Queenstown. From here, walk along the famous Routeburn Track, explore the resort town of Wanaka and delve deep into the heart of Mt. Cook National Park. With different activity options available to suit everyone, this kiwi adventure is an outstanding introduction to the South Island. 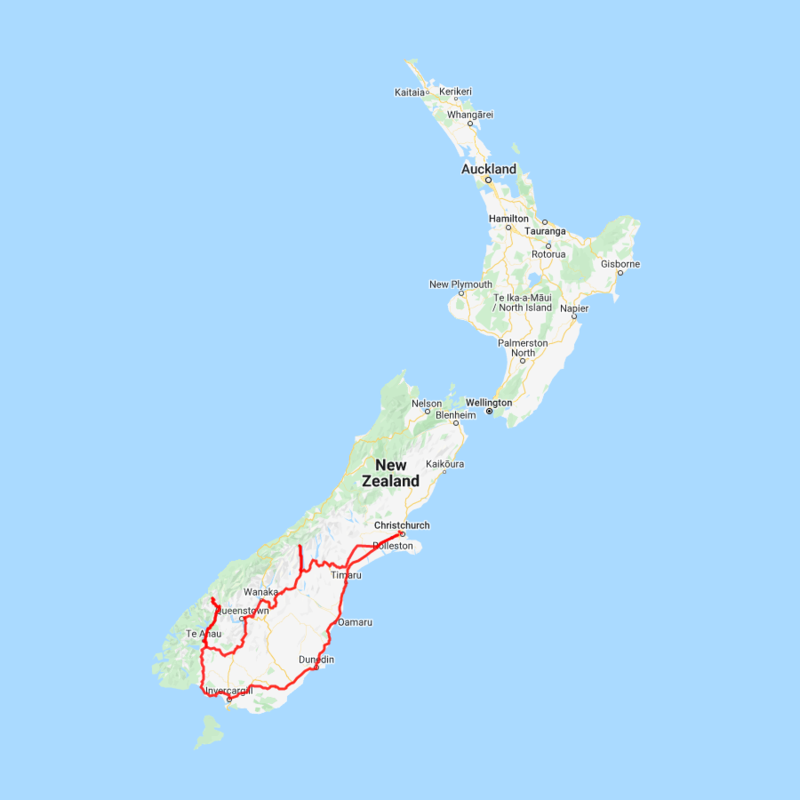 You can expect to spend around NZ$249 in fuel cost on this itinerary based on an intermediate sized car. There are a number of short walks to enjoy on the Peninsular. The information below is provided by the Department of Conservation . Getting there - drive is approximately 25 minutes from the centre of Dunedin. Turn off Highcliff Road onto Sandymount Road, then right onto Seal Point Road. The carpark is at the end of this road. A path crosses farmland to the top of the sand dunes. Go down the sand hill - which can be rather testing on the return, uphill journey - and walk about a kilometre along the beach. Near the southern end a marked track leads up to a hide to view the locals, yellow-eyed penguins. Please keep at least 10 metres away from sleeping sea lions, 20 metres from active animals and if you are in a group don't surround them. With penguins, please don't linger on the beach below the hide, or anywhere else where they may come ashore. If you encounter a penguin on the beach keep well away and crouch down. If they feel threatened they will not come ashore. Getting there - drive is approximately 30 minutes from the centre of Dunedin. Turn off Highcliff Road onto Sandymount Road and the carpark is at the end of the road. The loop track begins at the carpark at the end of Sandymount Road. This walk via The Chasm and Lovers Leap - with a side track to Sandymount summit - gives spectacular views of Otago Peninsula's coastline and cliff tops. Another marked route provides alternative access to Sandfly Bay. The Lovers Leap and Chasm tracks are closed for lambing, 1 August - 31 October. Getting there - drive is approximately 40 minutes from the centre of Dunedin. From Portobello turn onto Allans Beach Road. The carpark is at the end of the road. Special wildlife such as sea lions and penguins frequent this wild ocean beach. Please respect their needs by keeping at least 10 metres away from sleeping sea lions, and 20 metres from active animals. Do not linger on beaches where penguins may come ashore. Overnight cruise returns then onto Queenstown. Outlet Track This is a local favourite as it is an easy walk suitable for all ages and abilities. It begins from Wanaka town centre and takes you around picturesque Lake Wanaka to the outlet to the Clutha River and on to Albert Town. This track can also be explored by bike.Distance: 3 km one way. Completion Time: 1 hour one way. Diamond Lake and Rocky Mountain walks These two excellent walks in the Diamond Lake Conservation Area give wonderful views of the surrounding alps and Lake Wanaka.Distance: 2km - 7 km depending on trail. Completion Time: 45 mins - 3 hours depending on trail. Rob Roy Glacier Track Rob Roy Valley is a good entry point to an area of spectacular alpine scenery, snowfields, glaciers, sheer rock cliffs and waterfalls. The road to this track is unsealed and unsuitable for rental cars, but transportation to the beginning of the walk can be arranged.Distance: 10 km. Completion Time: 3 - 4 hr return. There is avalanche danger during winter and spring (June-November) on the Rob Roy Track. Roy's Peak Track The most famous famous walk in the Wanaka area, this steep walk climbs 1,500m on a well-formed track with the most spectacular views of Lake Wanaka, its islands, bays, and the mighty snow-capped mountains of the Southern Alps, including Mount Aspiring.Distance: 16 km return via the same track. Completion Time: 5 - 6 hr return. This track is closed from the 1st of October - 10th November each year. In winter alpine equipment (such as crampons) are required. Isthmus Peak Track A long, steady climb that rewards walkers with spectacular, panoramic views of Lake Wanaka and Lake Hawea as well as the mountains of the Southern Alps.Distance: 16 km return via the same track. Completion Time: 5 - 6 hr return. This track is closed from the 20th of November - 20th December each year. This track is not recommended in winter due to snow and ice build up on the track.